Chart based on 246 repairs. 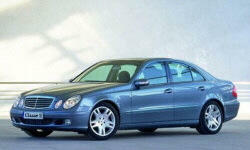 See TSBs and recalls for the 2006 Mercedes-Benz E-Class. 29140 mi Faulty glow plugs replaced. US $1800 Car was listing on the driver side. Found driver-side front strut leakage (Airmatic), repair not possible, replaced with original new MB part. No issues since. US $300 Replaced Balancer shaft, which required removing engine and taking it apart. Replaced valve body and conductor plate. A crack in the intake manifold was found, so that too was replaced. Those all together took 40 hours of labor, plus parts paid $10 grand by 3rd party warranty. US $871 third party warranty paid $1565 for replacement of a wheel bearing, front thrust arms and bushings, front stabilizer bar I kept getting low battery messages when starting. Batteries tested out ok. Replaced K75 Relay due to electrical fault. not covered under warranty, paid out of pocket $427. 82000 mi I have had a problem with the transmission before my car went out of warranty. Purchased extended warranty and car has had significant transmission problems. Dealer said car needed new transmission but warranty co would not pay. US $350 Return repair from previous transmission problem. Transmission stuck in 1st gear. Replaced trans. computer.Problem with shifting returned w/ check eng. light. Reflashed trans. w/ new SW. Replaced tension pulley as well due to squeaks. US $100 Minor oil leak from PCV valve, so it was replaced since the part/labor was inexpensive. US $100 Shock for rear lift gate failed and would not hold the gate up. Replaced both shocks. 134000 mi Failed ABS unit. US $250 Multirib belt "blew," broke idler and Groved. Replaced belt, idler pulley, accessory belt tensioner, groved pulley. Cam plugs replaced. US $1146 Replaced both airsprings with Arnott bags. My left bag had a hole in it lowering the back end making the car undrivable. US $722 Replaced intake manifold, 2 coils. Added refrigerant to AC. US $70 Leaking cam plug. 83000 mi Radio repair. The right side speakers cut out sporadically when listed to with engine off. I have to turn off the car for a minute to get them to work. Dealer unable to fix. 21541 mi SRS System malfunction - caused by faulty harness connection in steering wheel to the steering wheel angle sensor from SRS system. Replaced wiring harness. SRS System malfunction - caused by faulty harness connection in steering wheel to the steering wheel angle sensor. Replaced wiring harness. US $1000 Broken Spring Replaced - Right Front. Caused by hitting curb. US $848 Replaced Water Pump. Small Leak. US $1300 Replaced Glow Plug Control Module Repair Trunk Ground Wire - Soldered Wiring Harness Exhaust System - Broken Exhaust Bracket, Weld Failed Due to Corrosion - Attached to Catalytic Converter. Removed Exhaust Pipe, Repaired by Re-Welding, and Grinding. Reattached to Vehicle. US $300 water pump and serpentine belt replacement -- expected at 129k miles, serpentine belt was also original. US $371 Wipers were not functioning properly, kept hitting A pillar. Arms were re-adjusted. US $252 Main circuit board was cracked during subwoofer install causing no power to instrument cluster. Mechanic ordered and replaced cracked part. US $179 A/C was unable to cool the car down in 90 degree days. System was tested for leaks, refrigerant added. US $1000 Thermostat needed to be replaced. Coolant system was drained. 2 batteries were failing to hold charge Glow plug control module needed to be replaced. 113000 mi Rear door ashtray would not retract. Had to replace piece. US $180 Alarm siren/door lock beep thingy stopped working. Replaced with new unit. US $400 Water pump started leaking, replaced water pump and idler pulleys, latter preventive. Engine motor mounts failed and were completely collapsed. Replaced both mounts plus the transmission mount (which was still okay). US $60 High pressure fuel pump was leaking at startup when engine was cold. Replacement pump is expensive, so I bought a seal kit from Europe and replaced all the seals. US $1200 Fan motor, bad bearing causing a chirp. US $453 Right rear-end differential seal was leaking. Replace all 3 seals as a precaution. US $1063 WORN OUT TIE ROD, BALL JOINTS ETC. US $135 AC system evacuate and refill. US $90 Driver's side head rest adjustment broken. Both front seatbelts are filthy (pull out to see all). Broken plastic trunk latch cover. NAV screen scratched and cloudy. Replaced cover, polished screen. Sometimes the AC fan just shuts off, even when fan indicator lit. Must press off, then Auto, to restart. Replaced control unit. Sunroof sometimes does not close unless you hold down the button. Center speaker is scratchy when listening to talk programming, replaced it. Front license plate screw cover missing. 29000 mi Front passenger seat noticeably loose, allowing it to swivel from side to side. Seat track replaced. 45000 mi Transmission not shifting properly. Repair shop noted transmission fluid leak, replaced gasket and leak stopped. US $190 air conditioner became less effective during longer trips, noticed ac condenser pipe freezing up. Replaced humidity sensor and problem appears resolved. 55000 mi Low level oil sensor replaced. 30000 mi Leak of fuel tank where level sender enters tank. 32000 mi SOS (like OnStar) system was unable to communicate with SOS central because of corrosion or dirt on electrical contacts. Dealer clean antenna input corrosion and problem was solved. Better fix would have been to disable the system. US $1100 Alternator failure. MB makes over-complicated alternators that are prone to failure and ridiculously expensive to repair. Glow plug failure. US $16 No. 1 glow plug failed and I replaced. Shop wanted $200! I did it myself for $16. US $500 Steering angle sensor failure. Replaced SAS, but error code remained. US $200 Yaw sensor failure. 34000 mi AC froze up. Temp sensor replaced. 74300 mi Center dash speaker was replaced. 94200 mi Replaced DVD drive in GPS map reader Gear whine at specific speeds and load condition Speed sensitive volume control is getting oversensitive. Radion volume goes up and down randomly. US $550 Installed new pilot bushing, conductor plate and shift overlap sleeves in valve body. Replaced water pump, thermostat, coolant. The thermostat was getting weak (holding temps around 65C rather than 92C). Replaced accessory belt, idlers, tensioner due to a squeal on start-up. US $125 Warning light for Embrace system came on. I could communicate with the Embrace center OK and they with me. Took to dealer. They removed and cleaned something called a splitter in the trunk area. That was a week ago. Everything fine since. US $1012 Front ball joints, one front control arm, S-belt, alignment. US $900 excellent car. follow service manual and drive. 18500 mi Center speaker replacement. US $230 Bad belt tensioner and idler pulley bearings. Replaced tensioner assembly and pulley bearing. US $10 Wiring to auto trunk closer damaged. Common problem fixed with common electrical connector tools. US $65 Idler pulley for accessory drive belt replaced due to noisy bearing. US $210 Replaced alternator. Bad diode due to failing aux battery. Replaced battery also. 39000 mi Replaced transmission valve body due to inconsistent shifting. Replaced window switch assembly due to child lockout switch being inoperable. 40000 mi Return of inconsistent shifting. Reflashed transmission computer. 40000 mi Return of transmission shifting problem. New software was available and seems to have finally corrected problem. Sirius satellite radio continually dropped signal. Replaced tuner module. US $200 ongoing shift problem with transmission. Likely will require more work, like valve body or conductor plate replacement. Transmission still works, just shifts erratically sometimes. US $700 Lights were worn - could not be resurfaced. Replaced light fixtures. US $200 Rear Air Springs Engine runs rough sometimes, indication is that catalytic converters need replacement. Repetitive codes appear and will likely need to replace exhaust components. US $300 Trunk would open. US $350 Grinding vibration from rear of car. Replaced oil in transfer case. Problem fixed. US $200 Grinding in transfer case at slow speed turns. US $1400 Electronic trunk closer became defective. Leaks in air conditioning system required flushing, refill, new parts. A nightmare! 37000 mi engine management update. 53100 mi Windshield washer on driver side replaced last week. US $700 the automatic trunk raiser/closer stopped working. dealer determined that it was fault in the rear wiring harness. repair was successful. US $28 moonroof would not retract. plastic bracket for the wind deflector spring broke. broken piece jammed in track. very common mercedes fault. US $180 windshield washer container was leaking. replaced. US $2500 fuel tank was leaking. entire unit had to be replaced. THIS IS A COMMON W211 problem. the local dealer keeps tanks in stock. parts price $1900. 39000 mi Replaced cracked wood detail on drivers side door panel, and loose door sill plate..both under warranty. 53000 mi Left front ball joint replaced. 76000 mi Cam plugs and oil centrifuge leaking, replaced plugs and centrifuge. US $820 Radiator thermostat went out, also needed software reset due to fuel vapor warnings. US $55 Outside temp senso came unclipped from grill. US $352 Ignition coil on cylinder #4 went out. US $1800 Replaced leaking cam plugs and oil centrifuge cover. Also performed 156k service, and replaced original main battery (11yrs old). 15000 mi Passenger headrest adjuster switch broke off. Entire switch replaced by dealer in 15 minutes. A belt pully and pully guide was replaced because of a dealer campaign to do so. 17000 mi SRS light came on, called dealer service manager. He said it was probably the cable harness of the airbag line to the steering column module. He ordered and replaced: the cable harness and the cable connector. 37200 mi SRS light came on and was probably the steering wheel contact spring. I don't have the invoice yet so I don't know what was done exactly and how much. Trim had cracks that were present when I bought the car. Just didn't bother to replace til now. C $4000 Balancing shaft worn out. 28520 mi Driver's door handle key sensor stopped working; new handle installed by in home service driver who came to my place and replaced the handle. it took about 15 minutes and cost nothing. Wonderful service. US $4000 CEL read 'Retarget Cam Shaft'. Got astronomical quote; traded the car in the following monday on a new Kia Sportage SX. C $200 When engine is cold, it makes noise, which seems to come from the belt/tensior pulley/s. Some pulleys have been changed, but noise is still there. I am waitng for new part and will try to repair it this week. 111600 mi The car has been running rough for a while and it got worse. The engine light as well as the battery light came on. Mechanic told me that it is the sensor for the camshaft. Not fixed yet, will have to take it back after the New year. US $60 Car gave P0015 error code, camshaft timing retarded. Purchased new camshaft solenoids/magnets and replaced both passenger side solenoids, which cleared the code. No real symptoms present during the time the code was active. US $80 CPS failed causing car to lose power mid-drive; regained power immediately but did not drive again until CPS was replaced. Apparently they die every 80k-120k miles. Tricky to reach CPS, but still a relatively easy repair. US $55 Engine was not reaching operational temperature (97C), remaining at ~40C during colder months. Drained coolant and replaced thermostat which solved the problem (heats up within 5 minutes of drive time) CEL with code P0020 came on. Somewhat inaccurate error description, fixed by replacing driver's side camshaft solenoids/magnets. US $90 The bracket holding exhaust pipe broke. Clunking noise on acceleration. This possibly caused transmission into limp home mode. See our lemon odds and nada odds page to see vehicles with no repairs or vehicles with more than three repairs. To see how frequently 2006 Mercedes-Benz E-Class problems occur, check out our car reliability stats.